Manufacturers: AER (Kit # 7209); LEVA (72-C-08 and 72-C-09); Resin Master (2R5 and 2R7). This was a major conversion project involving several kits and manufacturers. 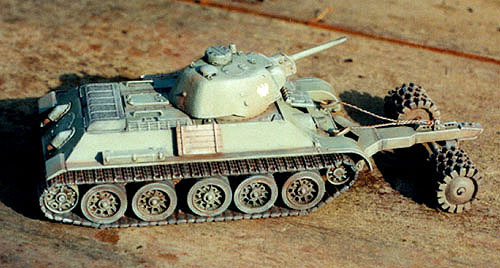 The base T-34 kit was the AER T-34/85. The turret and PT-34 are resin items from LEVA, and the wheels, and miscellaneous details are from Resin Master. 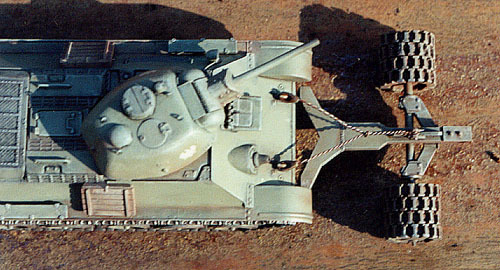 The AER T-34 kit is a T-34/85, and the LEVA turret directly replaces the kit turret. This kit is not really up to the standards set by today's newest kits, and is also not quite as good as the old ESCI T-34's. But it still has the correct shape, and its size scales out very well to 1/72nd. The hull has good detail. There are a couple of cables molded onto the rear plate of the hull, which are supposed to run into the two smoke barrels which were used on the T-34/85. These cables need to be sanded off the hull for this conversion. Also, the locating circles for the fuel barrels, and other hull parts should also be removed. The engine air intake vents are molded a little too shallow. Both Eduard and PART make etched brass detail sets for this kit, which include replacement grates, and this kit would definitely benefit from either set. The driver's hatch must be glued in the open position, or else major work would need to be done to improve the hatch hinges. In the open position, the hinge parts fit very well. Many of the kit parts are poorly detailed, and have been replaced by resin parts from the Resin Master Detail set. Although not used in this project, the 85mm turret included in the kit is only mediocre (and the gun barrel far too large), and is best replaced by a resin after-market turret. The spacing of the wheel axles is whacked. I recall reading about this in early reviews of this kit. Perhaps I read the reviews wrong, because I had the impression that this kit was incorrect in that all the wheels were evenly spaced, when in fact, three of the axles should be close to each other, and the other two, farther apart. Well, when I was building the model, I noticed that the kit axles were, in fact, staggered, not evenly-spaced. So I thought that perhaps the original review I read was wrong, and I built the model as shown. But ... after completing the kit, I looked closer at drawings of this tank, and realized that the kit is indeed wrong. The kit has the forward three sets of wheels close together, when in fact, it should be the rear three wheel sets. AER got it backwards. By the way, if you build this kit with the steel wheels included with it, be aware that they do not have enough lightening holes in them. The steel wheels in the ESCI kits are much better. I have mixed feelings about the tracks. They are hard plastic, link-and-length, which is good. But they are not as finely molded as the tracks included with the SU-85 and SU-122, which are produced by a company from Samara, Russia. The tracks in this AER kit are much thicker; too thick for my liking. However, the attachment points between each individual link is much less distinct, which has the effect of making them much easier to attach to one another. When I built the Eastern Express SU-122, it took a great long time to clean up each link, and sand and file them in order to get them to fit into each other. Consequently, these tracks assembled much quicker than the Samara tracks. And although I do not like how thick they are, the finished tracks looks very good. There are a large number of extra individual links included in the kit, so it is possible to replicate track sag, which I did only to a limited extent. Also, the guide teeth are not as tall as they should be, but that may be a molding limitation. These are the first LEVA items I have used, and I am very impressed by them. They are both extremely well detailed and well molded. The turret set comes with six parts (see scan at bottom of page): the turret, main gun, mantle shield, commander's cupola, commander's hatch, and hull-mounted flame thrower nozzle. As you can see, the modeler has the option of building the turret with or without the commander's cupola. I chose to use it. There is a substantial hole in the turret beneath the open hatch, so if a modeler chose to use the hatch, you can also add a commander half-figure (or whole figure, if you deepen the recess). I used the flame thrower nozzle for the OT-34 version. I have never seen a photo of a T-34 with both the flamethrower and the PT-34 mineroller, but I decided to use both for the sake of this review project. Besides, you never know. Both the PT-34 and OT-34 were support vehicles, so there may have been an example of a vehicle with both. I have heard stories of peole who had problems with LEVA resin (sticky, not adhering to glue), but I had none of those problems. A LEVA representative told me that they had a bad batch of resin in the past, and have since fixed the problem. Indeed, the quality of the resin parts I used was top-notch. 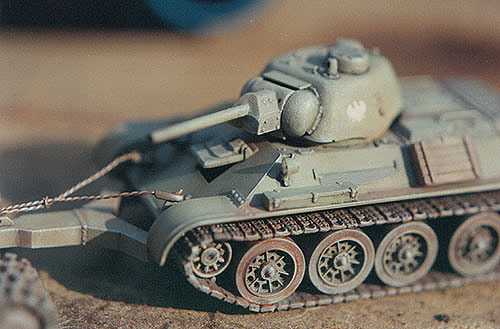 The PT-34 has exceptional detail, and again, is very well-molded. However, based on the few photographs I have been able to find of this item, I believe that the radius of the roller wheels is too small. From what I've seen, the rollers should be more massive. 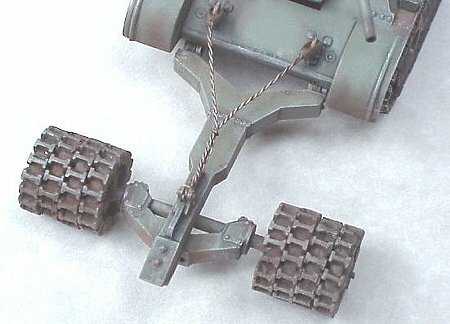 The modeler is required to fabricate some cable to attach the mineroller mechanism to the tank. I did this by twisting strands of fine solder, and gluing the ends into the tow cable end-loops from the kit, which I cut off the plastic cables, and drilled a hole into the ends. I owned both of these sets before I received the donated review items, and there are some differences between the donated sets, and the older ones which I've had for several years. The wheels are the "spider" style, with pierced metal wheels, and rubber tires. In my older set, each wheel is a separate part, but in the newer set, each pair of wheels is a single piece, with a groove cut down the center. This arrangement greatly simplifies the construction, however, the groove was not cut deep enough, and a heavy wash was needed to make it appear deeper. It would have been better to paint the groove black. It was also necessary to snip off the guide teeth of the track links passing over and under the wheels. The rubber tires should be perforated, not solid as these are. Two of the wheels on each side are extremely close to touching each other. I've checked many scale drawings, and the best I can figure is that these wheels are perhaps just a hair too large in diameter, perhaps by less than half a millimeter. But when you have two wheels next to each other, that discrepancy is doubled, and they are then too close. Aside from that, they are very well-detailed, and well made. Be sure that you attach the wheels as far onto the axles as possible, else the track guide-teeth groove will not align with the groove in the kit's idler and sprocket wheels. 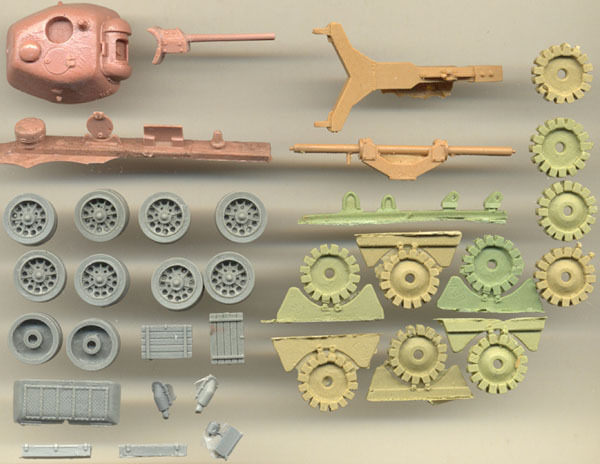 The T-34/SU-100 Detail set includes several parts intended to replace poor kit parts. With the exception of the antenna mount (which is in the parts scan below, but I did not use that part), all of the resin pieces are direct copies of ESCI T-34 kit parts, which are superior to the AER kit parts. In my old set, they also included a siren, which was not in this new set. The two mufflers have bolt detail around the outer edge. I had to sand the backs of the mufflers to thin the parts before gluing to the hull. The engine access hatch has much more detail than the AER kit part, but would be even better yet replaced with brass. The fender storage boxes have lid and latch detail, which the AER parts do not. However, in duplicating the ESCI parts, Resin Master also duplicated the deep sink marks in the boxes, which need to be filled with putty. The wooden ammo boxes are nice, but Resin Master did not clean off the sprue attatchment nubs on the edges of the boxes (! ), so be sure to sand those clean. In the scan above, the LEVA T-34/76 D Turret set is in the upper left. The PT-34 set is to the right. 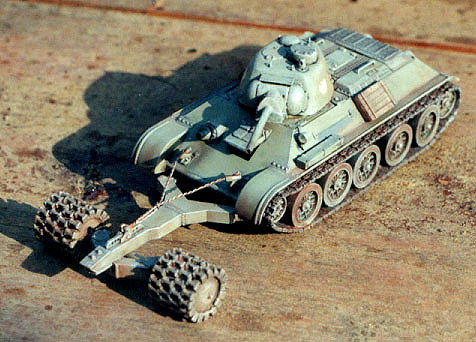 The Resin Master wheel set is below the turret, and the T-34/SU-100 Detail set is below the wheels. I painted the model in AeroMaster Acrylic Soviet Green. The markings are for a Polish Brigade, which I got from an old MicroScale sheet. I've seen photographs of a Polish PT-34 with the "Uralmash" turret (another name for this type of turret), but again, I don't know if it was also an OT-34. Thank You Very Much to Michael Hatch for providing the review samples.